Equine Management's Gel-Eze Bandage is specially designed for use in the competition arena, stable and during transit. 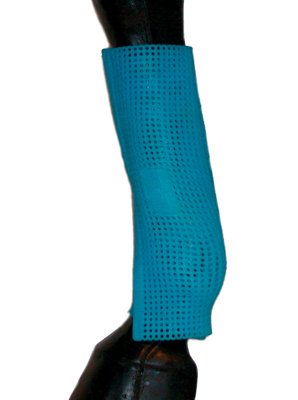 This high quality product acts both as a leg protector but when chilled, can be used as an instant and effective cold compress, relieving sore joint and tendons. When used as a cold compress, the Gel-Eze Bandage aids recovery from demanding exercise as well as hard ground trauma. Easy to use even on the most difficult of regions, fully washable, reusable, environmentally friendly and non-toxic. There are currently no questions for Equine Management Gel-Eze Bandage - be the first to ask one!